So the USMNT stages the greatest comeback in USMNT history, and the stupid ref calls the winning goal back for a phantom foul! 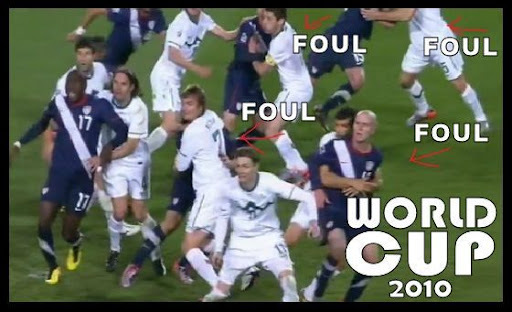 The US players, and all those watching at home, were mystified by this horrible call. I mean, WTF???? How the hell are idiots like this picked to ref in the world's most important sporting tournament? There should be an immediate investigation by FIFA (of course, they'll do nothing). According the this post in the great Dirty Tackle blog, the official FIFA report cites a foul by Maurice Edu as the reason the goal was called back. I guess referee Koman Coulibaly (a name that will live in infamy) had to come up with something! Someone please check his bank account! I guess I shouldn't be too pissed, as the USMNT found themselves down 2-0 in the first half. I should be happy with the point but I'm not. This would have been a fight-back of epic proportions had that goal stood. Landon Donovan (the greatest US player ever) scored the most incredible goal from the most impossible angle. It should be said that if the Slovenian goalkeeper hadn't been so scared to come off his line, Donovan would never have scored but WTF, we'll take it! The USMNT will advance to the knockout round by beating Algeria, by 2 goals, in their final 1st round game (or so I've read) however there are a few different scenarios to contemplate as well. Check out the highlights by clicking here and Go USA!